Sholinganallur is the nearest birding spot from where I live. It is home to many residential and migratory birds. But I haven’t been there much. I visit places like Vedanthangal, Kanchipuram or Pulicat, which are further away, during weekends. It isn’t easy to wake up at 3:30 AM and leave for a 2-hour drive with bad roads and poor visibility. Yet I wouldn’t have it any other way. I believe that nothing worth having comes easy. Whenever the universe has been randomly benevolent – without expecting something in return – I have questioned its motive. Karma doesn’t work that way. Even if we may not always reap what we sow, we must keep toiling away in the fields. Especially, during the harvesting season. Over the years I probably missed out on several new sightings at the Sholinganallur Lake, off the Old Mahabalipuram Road. It occurred to me during a recent visit when I spotted an Osprey for the first time. Unfortunately I couldn’t take a photograph. I had put the camera away, having mistaken her for a Black-Winged Kite I had seen earlier that morning. Only seconds before she disappeared, did I realize that she was an elusive sea eagle. Excited nevertheless, I parked my car near the toll both, and went for a walk along the lake bed. I saw Black-Winged Stilts, Purple Swamphens, Eurasian Spoonbills, Greater and Lesser Egrets, Spot-Billed Pelicans, Northen Pintails and Spot-Billed Ducks. They were lounging by each other, silently, in perfect harmony until the Darters came over to wreck their zen mode. It was hilarious, watching the rest hastily leave in annoyance. As if that weren’t enough, a Golden Oriole enthralled me by sexily sauntering on a flowering branch. Next weekend, I intend to hop on a bus and go birding as further away from Chennai as I possibly can. And if I am lucky, I may survive another near-death experience and come back to tell you how suspicious I still remain of the universe. and her silence – everywhere else. I want to be a purple swamphen. She’s beautiful. On the other hand, the Eurasian Spoonbill looks like many professors I have known. What a lovely day of birding you had! I am told that the Eurasian Spoonbill was in her breeding plumage. Perhaps that explains her decisive looks! Ah the smell of madness!!!! “All it needs is a little push” – said the joker nevermore! You mistook an osprey for a kite? That’s a bit like mistaking an ostrich for a turkey isn’t it? Or wasn’t there anything nearby you could use for scale? We’re pretty lucky in eastern coastal Australia, osprey-wise. I ain’t exactly a twitcher but I’d guess I average half a dozen sightings per year over suburban Newcastle. I regularly spot their large stick-nests in swamp trees too. I reckon you could easily spend a week of solid ecstasy in the nearby mangrove swamp Christy. Barring slight regional species variations I could easily have taken most of the shots above a short walk from my home, though I don’t think I’ve ever seen quite so many darters in such a tight formation. 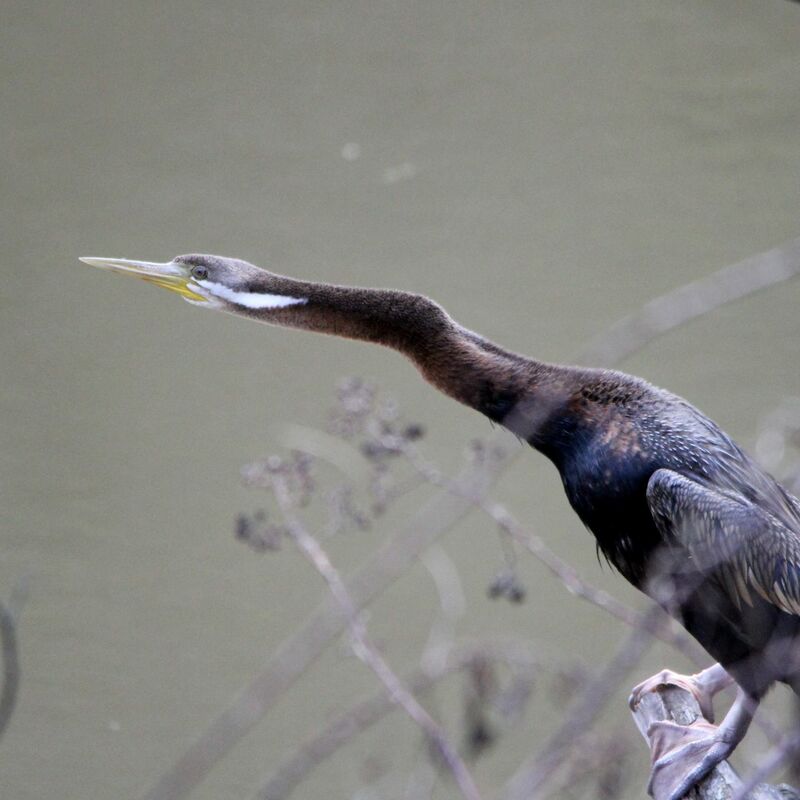 The local darters seem to have smaller heads and longer necks and beaks too. Pinheads of the bird world. The birds in your photo look more like the cormorants we get around here. It was at a distance, bud. Way up in the sky through my windshield. Given the commonality in their colours, she looked similar. Also unlike ostriches, turkeys or emus (because why not), these two were regularly spotted in the same area. Awww you have a mangrove swamp nearby! Sounds healing. Lovely. Took any photos of them? Took any photos of them? Nah, I’m not much of a photographer. Besides, with my $80 camera they’d mostly come out as fuzzy dots. Unless I put some fish gut on it. Then I could get a good close-up of a pelican’s gullet. Presuming I ever got the camera back. “pinheads of the bird world” – tea through nostril funny!